Unfortunately my Fischer G750 has taken a few too many pucks to the blade and the foam core has cracked to the point that bending the blade would show a gap straight through the inside of the blade. The foam core internals de-laminated and split apart. 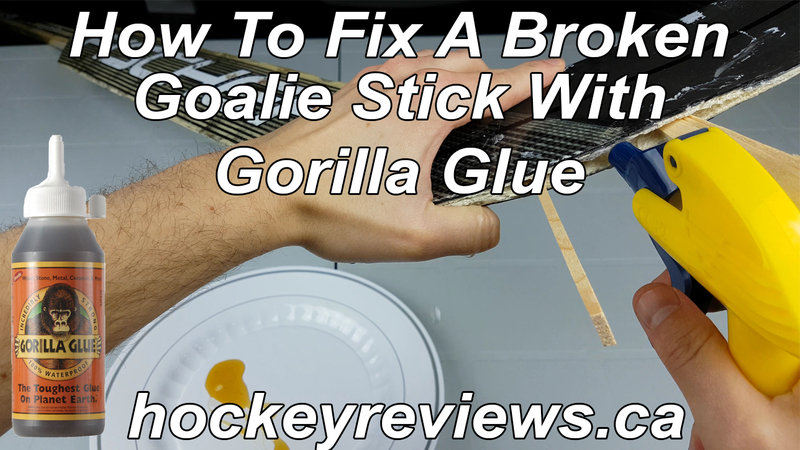 A couple people online mentioned gluing the stick together with Gorilla Glue, which isn’t quite as easy as just sticking glue inside the break. So I researched how Gorilla Glue works and it turns out that with water it expands into a foam and is very close to what is used inside of foam core blades. So I tried it out, filmed it and here is the results as well as a tutorial of what to do. If you noticed me doing something wrong, please let met know! Broken or damaged foam core or wood goalie stick. Tape (not cloth, as the glue can seep through the cloth). Water with a squirtable bottle. Plastic knife or spreading stick. Disposable plate or bowl to mix the water and the glue together. Ensure the damaged area is clean of dust or dirt, sometimes it is not really possible to clean the area (for example my scenario). Spray the damaged area with water since Gorilla Glue is activated with water, this is what causes the Gorilla Glue to turn into an expanding foam. Pour the glue onto the plate, would be easier to use a spoon and scoop it since the Gorilla Glue is so viscous it is difficult not making a mess. When ready to apply the glue, spray it or add water to the Gorilla Glue. Again this is done so the glue will expand into a foam like substance. Lather the knife or spreading stick with glue and spread it inside the break. According to instructions for Gorilla Glue you don’t not need to use a lot of glue when applying it, the glue will expand to approximately 4 times it’s size. 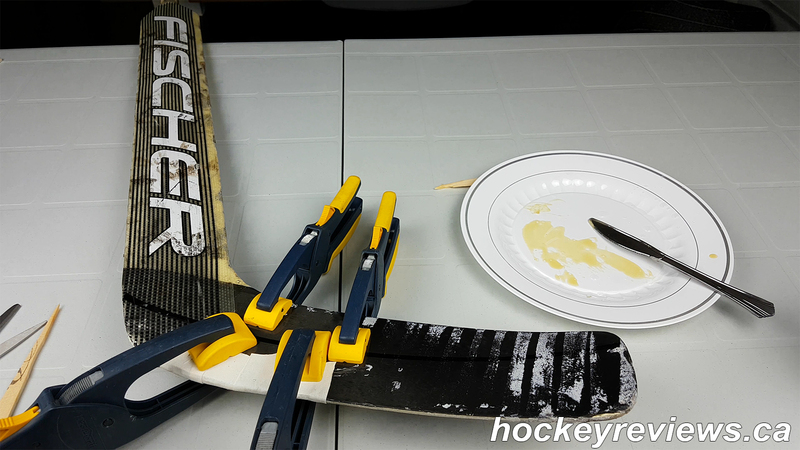 Tape up the seams of the stick where glue could possibly escape, this is done for easier clean up and so you don’t have excess glue bulging out of the stick. Once enough glue is applied, clamp down the stick around the broken area to ensure the stick is held tightly. This is needed so the glue doesn’t push the material outwards when expanding, instead the glue will attempt to go through the seams of the break that we just taped up. Gorilla Glue instructions say to keep it clamped for 1-2 hours and the glue will cure in 24 hours. I left my stick clamped for about 4 and the stick felt as strong as it was when I bought it. Remove the clamps after a few hours, I’d wait at least 12 until using the stick. Remove the tape and clean up any excess glue that spilled through the cracks. Shims holding the stick open so I can spread the Gorilla Glue inside. Clamps holding the stick together and the glue coming out the seams. Leave the clamps on for a few hours and tape up the seams for easy cleanup of the excess glue. 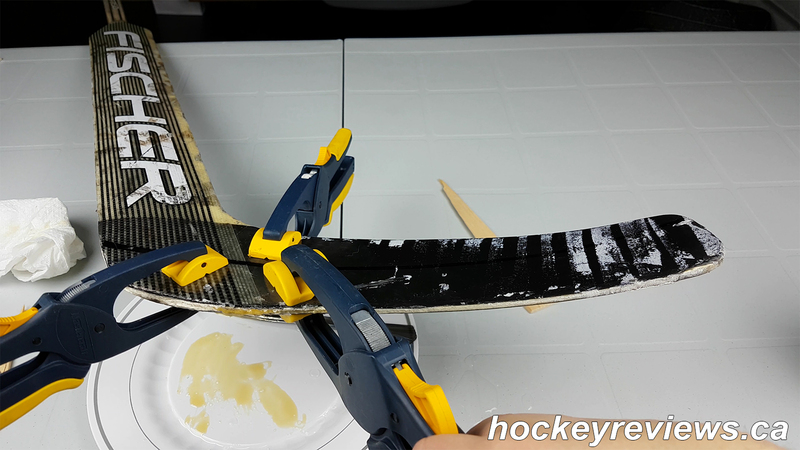 The final result of the glue, which is a solid material very similar to the inner “foam core” of the stick.